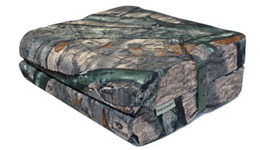 Field & Stream has selected the Hunt Comfort Specialist seat pad for its "Best of the Best" Award in the "essentials" category for 2010. The "Best of the Best" judging criteria include the significance of innovation, the quality of the design and the value it brings to hunters. The judges, comprised of F & S editors, writers and seasoned hunters, decided that the Hunt Comfort Specialist met the winning quality of excellence in its field.